This research focuses on designing an information display to support awareness during ad hoc, collocated, interdisciplinary, and emergency medical teamwork in the trauma resuscitation domain. Our approach is grounded in participatory design (PD), emphasizing the importance of eliciting and addressing clinician needs while gaining long-term commitment from clinicians throughout system development. 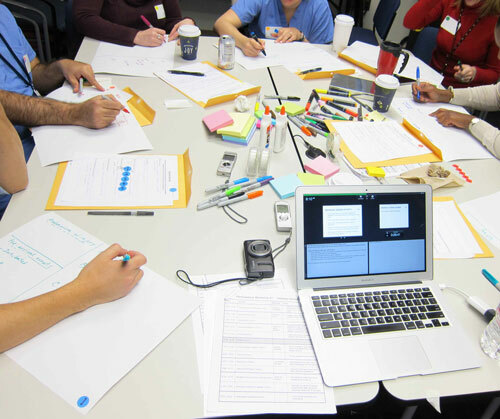 Engagement in iterative participatory and user-centered design activities with clinicians over the course of two years involved a series of PD workshops, heuristic evaluations, simulated resuscitation sessions, video observations, video review sessions, and a focus group. Sixteen iterations of an information display design were created. A perspective is offered on what awareness means within the context of an ad hoc, collocated, interdisciplinary, and emergency setting by examining teams treating severely ill patients with urgent needs. Drexel University & Children’s National Medical Center, Washington, D. C., Aleksandra Sarcevic, Ph.D. Worked on a multidisciplinary research team to understand and support health care providers’ information seeking and information provision behaviors during the trauma resuscitation process. Developed an information display to support trauma team situation awareness. Conducted display development using a multi-phased, iterative, and user-centered approach that combined rapid prototyping, participatory design workshops, simulated events, heuristic evaluation sessions, video observations, video review sessions, and focus groups. Drexel University, Michael Khoo, Ph.D. Worked on a team of student researchers investigating the space and use of an academic library to understand how a future library design can improve the patron experience. Assisted in designing and testing data collection instruments. Conducted qualitative data analysis and made design and service recommendations in a report to the library. Drexel University, Jung-ran Park, Ph.D. Conducted research on interpersonal communication patterns in online reference and online learning settings. Used discourse analysis, a qualitative analysis technique, to examine online interactions. 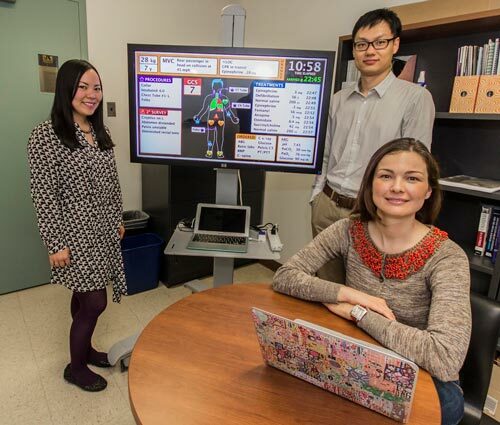 Drexel University, Eileen Abels, Ph.D.
Khoo, M.J., Rozaklis, R., Hall, C., and Kusunoki, D.S. (2013). Identifying the ‘go-to-spots’: using map surveys to elicit perceptions of space and place in an academic library. ASIST Annual Meeting, Montreal, QC, November 1-5, 2013. Kusunoki, D.S., Sarcevic, A., Weibel, N., Burd, R.S. (2013). Opportunities for blended interaction in emergency rooms: Coupling displays with digital pen input. Proceedings of the 7th International Conference on Pervasive Computing Technologies for Healthcare (PervasiveHealth), Venice, Italy, May 5-8, 2013, pp. 288-289. Kusunoki, D.S. and Sarcevic, A. (2013). A participatory framework for evaluation design. Proceedings of the iConference 2013, Fort Worth, Texas, February 12-15, 2013, pp. 860-864. Kusunoki, D.S. and Khoo, M.J. (2012) Designing digital library evaluation instruments: Conceptualizing a participatory methodology. Proceedings of the 2012 iConference, Toronto, Canada, February 7-10, 2012, pp. 632–633. Zhang, Z., Kusunoki, D.S., and Sarcevic, A. (2012). An analysis of decision making tasks and information sources in trauma resuscitation. Presented at Drexel University Research Day 2012, Philadelphia, PA.
Kusunoki, D.S., Khoo, M.J., and Wiedenbeck, S (2011). Lost in translation: Bridging the user-evaluator gap in evaluation instrument design. Boaster presented at the Human Computer Interaction Consortium (HCIC 2011), Pacific Grove, CA, June 14-18, 2011. Kusunoki, D.S., Khoo, M.J., and Wiedenbeck, S. (2011). Digital Library Evaluation Method Design. Presented at Drexel Research Day 2011, Philadelphia, PA.
Kusunoki, D.S., MacDonald, C., Abels, E., and Khoo, M.J. (2010). ipl2 Website Evaluation. Presented at Drexel Research Day 2010, Philadelphia, PA.